The Panzerkampfwagen III, commonly known as the Panzer III, was a medium tank developed in the 1930s by Germany, and was used extensively in World War II. The official German ordnance designation was Sd.Kfz. 141. It was intended to fight other armoured fighting vehicles and serve alongside and support the Panzer IV; however, as the Germans faced the formidable T-34, more powerful anti-tank guns were needed, and since the Panzer IV had more development potential, it was redesigned to mount the long-barrelled 7.5 cm KwK 40 gun. 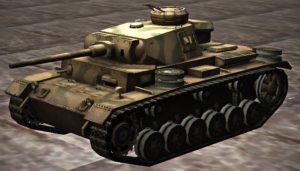 The Panzer III effectively became obsolete in the anti-tank role and was supplanted by the Panzer IV. 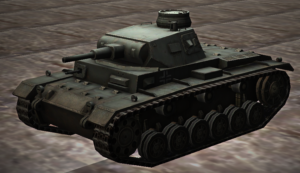 From 1942, the last version of Panzer III mounted the 7.5 cm KwK 37 L/24, better suited for infantry support. Production of the Panzer III ceased in 1943. Nevertheless, the Panzer III’s capable chassis provided hulls for the Sturmgeschütz III assault gun until the end of the war.